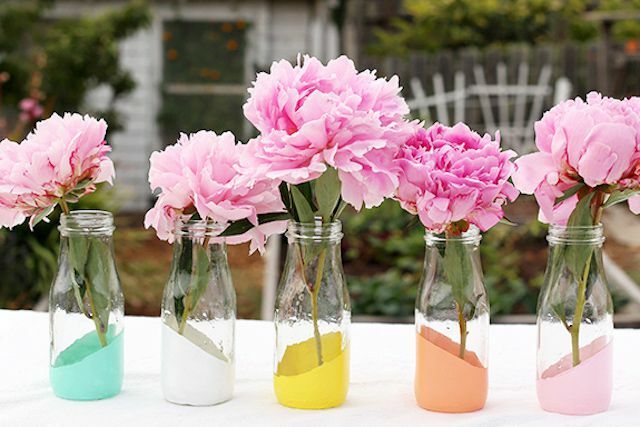 These DIY Vases will help you celebrate the first blossoms of spring. Display fresh flowers beautifully with one or more of these 35 ideas. From glittery paint, to stone and marble effects, to geometric patterns, you'll be sure to find the perfect design idea for your decor style. Continue to 2 of 36 below. Add a touch of luxury to a plain glass vase by applying sheets of gold leaf to the base for a glamorous finished product that's perfect for your fresh flowers. Continue to 3 of 36 below. Anything holographic is very trendy right now, from fashion to interior decor. One easy way to affordably incorporate this trend into your home decor is to apply holographic vinyl film around a glass vase. Continue to 4 of 36 below. Add some humor to your desk by crafting your own typographic flower vase that says "buds" or "grow up" on a bold eye-catching neon background. This DIY is super cute, and includes a tutorial for a matching picture frame! Continue to 6 of 36 below. Even if you do not consider yourself artistic, you can easily recreate this brushstroke vase by painting small strokes all around one of your glass vases. Continue to 7 of 36 below. Build your own vase out of pieces of wood and paint a graphic chevron pattern over the exterior of your completed vase for a decorative accent on your desk. Continue to 8 of 36 below. Make several smaller vases out of your old glass Christmas ornaments. Together they're perfect as a centerpiece for your coffee or dining room table. Do you still have leftover gold paint from your last DIY project? Use the paint to add a gilded base to a plain glass vase for a stunning display in your home. Continue to 10 of 36 below. Next time you're at the craft store, look for empty glass milk bottles. They're a great item to have on hand for crafting and DIY projects. You can dip them in paint to create a vase with rustic-vintage appeal that's perfect for holding a few flowers from your backyard. Continue to 11 of 36 below. Paint your own custom design for this DIY vase project. Using screen adhesive, apply gold foil to a ceramic vase to add some metallic details to your home this spring. Continue to 12 of 36 below. Decorate a wall in your home with fresh flowers by DIYing this unique vase. Hang several test tubes in a row; they're perfect for displaying a single blossom stems each. Here's an easy way to recycle your old glass bottles: peel off the labels and paint them to give them a bold and bright decorative stripe design. Collect the bottles together and they make a pretty centerpiece on any table. Continue to 14 of 36 below. Give your old vase a much-needed makeover by adding a marble design. This clever DIY project is easier than you'd expect and it will have you wanting to add a marble dipped design to all of your flower vases. Continue to 15 of 36 below. Bring out the warm tones in your tulips by creating a matching vase with copper details. You can make this DIY copper vase with contact paper that you simply stick onto a plain vase. Continue to 16 of 36 below. This beautiful confetti glitter vase would make a perfect centerpiece for a party or wedding. It elegantly adds a bit of sparkle to your floral arrangements. Repurpose a mini paint can leftover from your last DIY project. The finished product is perfect for displaying your favorite flowers at your desk. Continue to 18 of 36 below. You can temporarily change the appearance of one of your vases by sticking on strips of copper tape, creating a unique decorative design. Continue to 19 of 36 below. Stamp on a dot pattern to create a striking black and white vase. Continue to 20 of 36 below. Celebrate a loved one's birthday, job promotion, an engagement or any other victory by surprising them with an arrangement of flowers enthusiastically presented in a handmade "yay" vase! Perfect for your next dinner party, this long wood vase makes a great low centerpiece to display flowers on your dining room table. Continue to 22 of 36 below. We love when a craft calls for everyday household or pantry items–it just makes things easier! So grab the Kool-Aid and craft a beautiful dip dyed vase for your home. Continue to 23 of 36 below. Surprise the person you are dating with a handmade double heart vase–a romantic gift they are sure to adore. Continue to 24 of 36 below. Learn how to add a frosty effect to any glass vase for a truly cool way to display your flowers. It's hard to tell at first glance, but these mini rope vases are actually made with sculpted clay made to look just like rope. When complete, these tiny clay rope vases are perfect for displaying small flower buds that would be too short for a regular vase. Continue to 26 of 36 below. Instead of tossing your tin cans into the recycling bin, put them aside to decorate later. Voila–cheap and chic decor for your home! Continue to 27 of 36 below. Invite all your friends over for an evening of crafting. Have everyone start with the same wood vase and each person can paint on their own unique design. In the end you'll have a collection of eclectic vases to display. Continue to 28 of 36 below. Decorate for your next birthday or anniversary party with confetti covered vases that you crafted yourself–perfect for holding brightly colored flowers on your dining room table. Add texture to a bland vase with paint and this DIY technique. The completed faux stone vase looks much more expensive that it actually is. Continue to 30 of 36 below. Learn how to apply beautiful lace detailing to a vase with this elegant DIY. Continue to 31 of 36 below. Add a bit of sparkle to your desk with a beautiful DIY glitter vase that is sure to bring a smile to your face. Continue to 32 of 36 below. Add some color to a regular wood vase with this simple color block design. It's quick and easy enough to get done in a weekend! Tight on space in your apartment? Make use of vertical space by crafting a hanging vase display that takes only minutes to make. Continue to 34 of 36 below. Don't throw away that rind! Scoop out all the insides of a watermelon, so that you are left with only the exterior shell, which you can then display flowers in. Continue to 35 of 36 below. Perfect for a party, this amazing DIY disco ball vase is going to impress all your guests! Continue to 36 of 36 below. Gather together several colorful vases in varying sizes to create a cheerful flower arrangement for your home this spring.